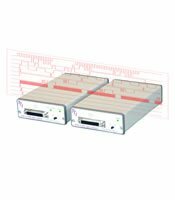 The LTX-5525 “Signal Transporter” Converter pair is designed to transmit 16 independent digital signals to a remote location via fiber optic cable. These products simultaneously samples all 16 input channels at 100 Ms/S, converts them to a serial format, transmits the data over a Multi-Gigabit fiber link and converts the signals back to a parallel format at the receiving end of link. The primary applications are those situations in which the signals of interest have a high common mode voltage with respect to the measurement equipment. These applications include plasma physics experiments, EMC test chambers, power transmission equipment, and high power laser equipment.